يشكل فندق Mantra on the Inlet بموقعه الممتاز في قلب نورث بورت دوجلاس نقطة انطلاق ممتازة لاستكشاف بورت دوجلاس. يمكن من هنا للضيوف الاستمتاع بسهولة الوصول إلى كل ما تقدمه هذه المدينة النابضة بالحياة. يشكل هذا الفندق ملاذاَ مريحاً للاسترخاء ويمنح زواره فرصة للاستجمام والتجدد، وهو يقع على بعد خطوات من المعالم السياحية الكثيرة للمدينة كمثل: Studio 49 Artisan Gallery, اكوموديشن بور دوجلاس, Funstuff by Lynda. استمتع بالخدمات الراقية والضيافة التي لا مثيل لها بهذا الفندق في بورت دوجلاس. يمكن الاستمتاع بمجموعة من الخدمات على أعلى المستويات في الفندق كمثل واي فاي في المناطق العامة, صف السيارات, رعاية أطفال, غرفة عائلية, جولات. تنعكس أجواء Mantra on the Inlet في غرف الضيوف.اتصال لاسلكي بالإنترنت, غرف لغير المدخنين, مكيف هواء, مكتب, شرفة/ تراس هي بعض الميزات الموجود في العديد من الغرف. يقدم الفندق مجموعة واسعة من وسائل الراحة المتنوعة، كمثل: مسار جولف - ضمن 3 كم, حمام سباحة خارجي, تدليك, حديقة. إن Mantra on the Inlet هو خيارك لخدمة الفنادق الراقية في بورت دوجلاس. ساعات عمل مكتب الاستقبال في هذا العقار من الساعة 9:00 صباحًا إلى الساعة 5:00 مساءً كل يوم. وإذا وقعت ساعة تسجيل وصولك خارج هذه الأوقات، يرجى الاتصال بالعقار قبل الوصول بيومٍ واحد على الأقل. Great location, great facilities. The room was beautiful but was in need of some minor maintenance. There is no lift which was disappointing but there is a bags lift from the basement which was extremely handy but was also problematic with its operation at times. The pool was fantastic and the hotel is well positioned with restaurants and bars on all sides. We would definitely stay again! location was good, close to many food options and the reef tours. however as internet and housekeeping were not included, it felt kind of expensive. A really great room in a great location, only downside for the not so fit is there is no lift so from underground car park had fifty stairs to get to my room on the second floor. Good accommodation right in town next door to hotels and restaurants and 5 minute walk to marina for tours etc. Good for single or couple. The accommodation is basic but quite serviceable. The check-in and check-out procedure is a bit confusing because reception isn't often attended and enquiries need to be made to a sister hotel down the road. We were pleasantly surprised when we got to our room. It was spacious and well appointed. Fantastic location near all the eats and entertainment places in Port Douglas. Huge room, big bed, great spa bath and the biggest balcony overlooking the main street. Not noisy at all. Would recommend to couples. We were given 2 pool towel coupons for towel use 2 coffee pods for our 4 day stay. All additional towels and pods were an additional charge at the front desk of its sister hotel as this hotel does not have a front desk. 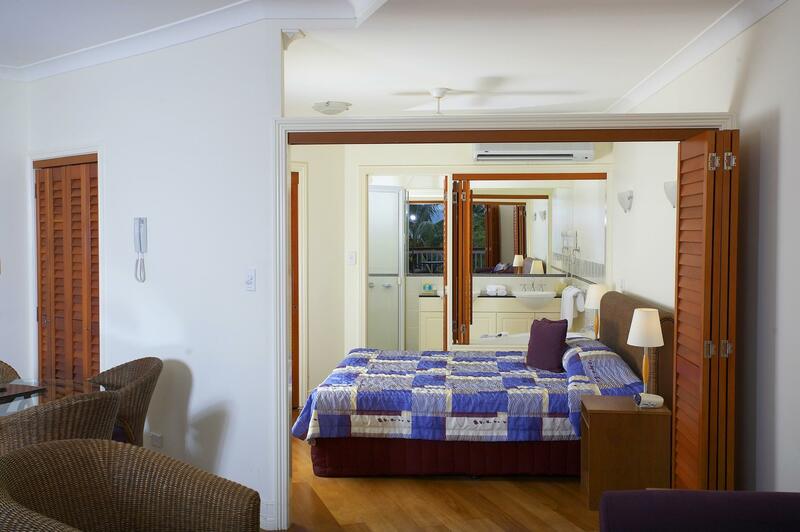 Basic accommodation in Port Douglas. Clean but small rooms in a great location. Very good, close to all facilities. Possibly one complaint would be that there is no lift and all suit cases had to be carried up stairs, with no porter or hotel assistance. The room was very clean and well presented with self catering facilities available. I have stayed in Port Douglas many times however this was my first visit to Mantra on the Inlet. I chose it because of location as we were in Port for a friend's wedding. It is perfectly located in the centre of town within walking distance to many restaurants and shops. I stayed in the apartment with my two children ( 10 and 8) and the room size was generous enough. The room decor was a little tired but clean. The main negative about this hotel is the lack of a lift; we were on the second floor and while I am able bodied and was happy to make several trips up and down the stairs with our luggage, there were elderly people in our group who struggled significantly up the two flights of stairs to their room. Something to consider before booking ! Great location, really, large 1 bed apartment with spa bath, kitchen and 2 balconies. Really, really large room. We had Room 219 - a 1 bedroom apartment -which looks out onto the inlet. 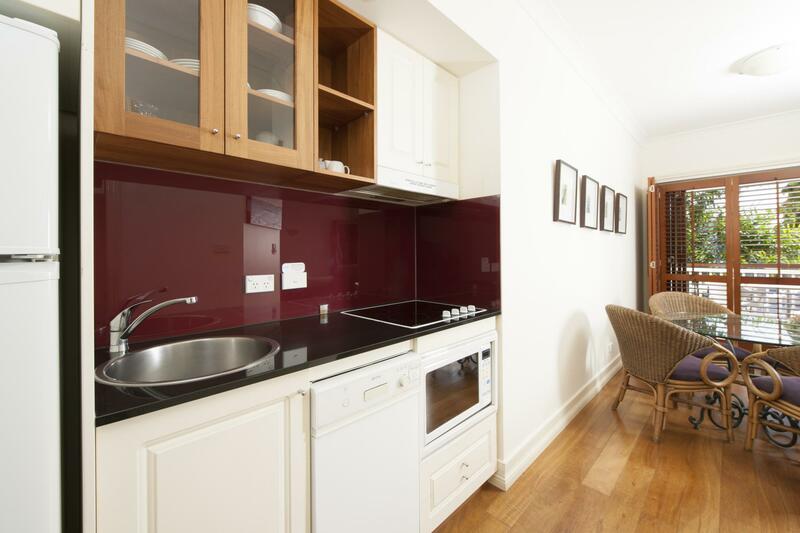 It is in the heart of town, beautiful polished floors, separate kitchen, large size fridge and a great spa bath. This room had 2 balconies, idealto sit outside with a cool drink. The king sized bed was a bit hard, but ok. Have to pay for Wifi. Check in and check out was do it yourself, so no personal touch. There is undercover parking underneath the building. Would recommend if you choose a 1 bedroom apartment, the hotel rooms are very small though.